Elocution: An Elocution Competition was held on the topic–“English and Mother Language”. Dr.Shashikiran.G., Prof.A.Mallikarjuna Reddy and Sri.Umesh were the judges. Number of students actively participated in the event and presented their topics in their own style and stance. Kum.Priyanka of B.Sc III Sem and Kum.Sumayya of B.Com.-III semester were the winners. 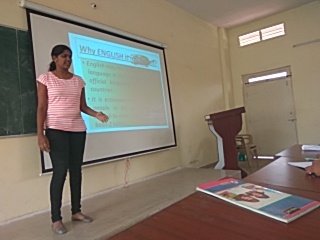 A Seminar on “Speaking Skills and Presentation” was held for M.Com students. H.O.D. of English K.Vijayendra Ranga Prasad was the Coordinator for the event and Faculty members Mr.Kotresh.N., carried out the seminar successfully. Kum. 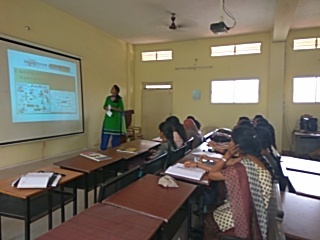 Anisha & Kum.Bharathi and other students presented the topic through PPT and explained various aspects about the topic. The Department of English had conducted “Love Kannada - Learn English” an English Awareness Programme in ShreedharaGadda village near Ballari. The English faculty Sri.K.Vijayendra Ranga Prasad, Sri.Ramesh S.M. and Sri.Kotresha.N., visited the houses in the village and explained the benefits of learning, English as a continental language along with Mother Language Kannada. The president of the Grama Panchayat Smt.Huligamma lauded the efforts of the English faculty. 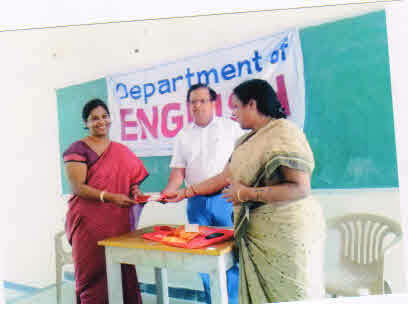 The Department of English had conducted “Examination Motivation Event” for PUC II year students. Mr.Kotresha.N., Faculty Member carried out the event explaining on the topic “How to overcome Examination Fear” He also interacted with the students on the occasion. H.O.D. Sri. Vijayendra Ranga Prasad, described the significance and benefits of learning English. Prof. Channaveerappa, Principal, ASM PU College presided over the event commended the efforts of Dept. of English in encouraging the students to appear the forthcoming examination without stress or fear. The Department of English had organised one week “An Intensive Grammar Course for Slow Learners”. Mr. Ramesh S.M., Guest Faculty was the Resource Person. He explained various topics of Grammar and created confidence among the students in learning English. H.O.D.Sri. Vijayendra Ranga Prasad explained important clues in attempting grammar questions. “Anuvada Event” - An event to check the power and ability of translation among the students. The department has conducted this interdisciplinary event. The event was jointly held by the Department of English and Kannada. The degree students took an active part in the event and translated the sentences of both the languages.